The Excel Invoice template with Sales Reporting is a customer invoicing management system with the ability to store orders, products and customer details and perform detailed sales reporting by product and customer. Product and customer lists can be imported from and exported back to text lists enabling integration with existing or future inventory and customer reporting management systems. Enter and set predefined content that flows through to each invoice created. Insert, update, retrieve and delete products, customers and orders in the system. Save up to 65000 products, 65000 customers, and 1.3 million orders in the system. Search and load previously created invoices for update or review. Import or export customer or product lists in CSV format for integration with existing inventory systems. Export invoices to separate Excel worksheets or XML files for saving or sending via email. Product inventory stock levels update automatically with new and updated invoices. Invoices can be updated with amount paid by customer to calculate aggregate uncollected revenue outstanding. 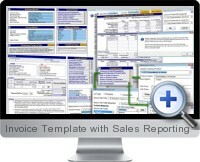 Generate sales reports to analyze customer and product profitability. Compatible with all versions of Excel for Windows as well as Excel for Mac as a cross platform invoicing solution. The trial download version can be used as free invoice template without the advanced features. More resources for the Excel Invoice template with Sales Reporting including video, user manual and support can be found on the Excel Invoice Template page. This is a very nice and simple program perfect for small business use. This is the most powerful invoice template I have ever used. Most templates on the market only contain simple equations, but this one can keep track of the records. Highly recommended. The invoicing system is a great tool and managing everything is very easy to use. First, the communication and support with Business Spreadsheets has been outstanding which is very important to me. I am not even finished with my project and I am already happy with what I have. I have seen software that costs so much money due to it's fancy decorative layout when meanwhile I only needed the easy to use, uncomplicated and appealing invoice system just as it is. Great work. A great invoicing tool to have. It meet all of my needs in regards to customer list, product variation and invoicing with different terms for different customers. Definitely recommended to individual and small business owners.